It was a windy, rainy night, the kind of night where strange sounds seem to emanate from every corner of the house. As usual, my family slept soundly, leaving me in charge of investigating and resolving any unusual incidents. At precisely 3:20 a.m. it happened. I heard human voices coming from somewhere downstairs. 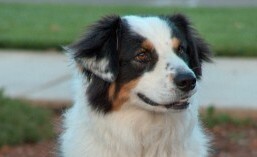 Now, permit me to pause here and explain something about my proud breed of Australian Shepherds. If you want a dog to frighten an intruder into cardiac arrest, get a Doberman, Rottweiller or similar intimidating protector. If you want a dog to gather intruders into a neat grouping in the corner of a room as they await someone to shear the wool from their bodies, I’m your guy. So I stealthily padded down the stairs and followed the voices, intending to quickly herd the trespassers into the nearest closet, slam the door and hold my body against it while barking for reinforcements (Aussies are better herders than planners). When I reached the source of the voices, an NPR interview on a guest room clock-radio which Mom accidentally activated while dusting yesterday, I was not amused. But before I silenced the alarm, I listened to the remainder of the interview which regarded the tremendous contributions dogs have made to humankind. It was quite illuminating. Then I trudged back to bed…but not to sleep. Someone has to remain alert to investigate bumps in the night, and I think we all know who that is in this house. This entry was tagged blog, dog, doors, guard dog, humor, intruder, NPR, rainy, windy. Bookmark the permalink.